If there’s one type of holiday we are experts in at Wombat, then that’s going on safari. It’s a look and style we’ve made an essential part of our collections over the years as the natural setting perfectly reflects our own ethos. For those who want to get an eye-opening glimpse of the wild then this is the best way to close look at Mother Nature in all her glory. The amazing thing about safari holidays is they are available all year round, and for those planning to head away in the winter, there are some fantastic deals to be found online too. Getting ready for your safari holiday is all about planning and ensuring you pack and prepare well. There’ll be plenty of walking ahead, so comfortable but strong footwear will be needed, and it goes without saying that clothing will need be light in both material and colour. The weather isn’t always bright sunshine so come prepared for the occasional downpour. You’ll need a bag to take out on your excursions and maybe a new travel wallet too. With the sun exposed high in the sky protecting the top of your head is vital. Not only that, it will help keep the rest of your body temperature cool. There’s a lot of items to cover but luckily for you we’re experts in this area and will run down some of the best we have to offer below. As you can see in Stephanie Be’s photo above you can keep cool in the shade with our Sand Coloured Washable Hat. The heat out in the open can be pretty intense, even when you place yourself in the shade. This hat is made to take the brunt of the heat as it bears down from above, allowing you to relax and enjoy the amazing scenery. 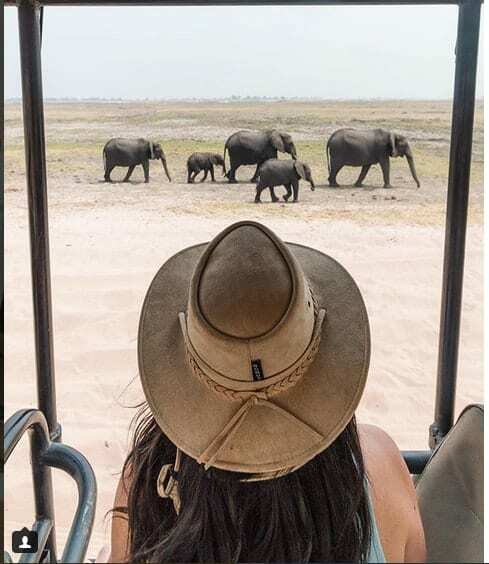 If you have a family of elephants walking right in front of you, as in the picture, the last thing you need is to be distracted with a sunburnt head. It can get pretty dusty out on safari but the great news is the hat is also washable, so there’s no excuses for it looking grubby for too long. Carly Martinetti is also wearing our classic Ridge Hill Foldable leather hat, its rugged style able to fit in seamlessly with either men or women. As you can see its rich, dark brown colour makes it a natural for the outdoors, easily blending in with the surroundings, so even a pack of muddy hippos won’t be able to tell the difference! You won’t be able to pack too large when heading away on safari, as many of the transfer flights will take place on small planes that set quite a low weight limit. The great news is that you are in the right place to take your pick from a wonderful selection of deluxe canvas bags. Take our Waxed Canvas and Leather Duffle Bag, for example. The thick, oiled leather is ideal for these sorts of long journeys that can stand up to long distance flights. While not completely waterproof, it can withstand the rain for short periods of time, which is ideal for safari holidays as flash showers can be the norm. Not only that, but you’ll ridiculously stylish too, which is a must wherever you are! For the times you leave the hotel and head out on tour to get closer to the animals, you won’t want to drag a large bag around with you. That’s where a Waxed Canvas and Leather Rucksack comes in handy. It’s light enough to hook over one or both shoulders and spacious enough for you to pack away any snacks or water (an essential) you bring along with you. Make sure you include insect repellent, binoculars, sun cream and a camera to capture those amazing moments, and you’ll probably still have some room left for one or two bits and pieces. 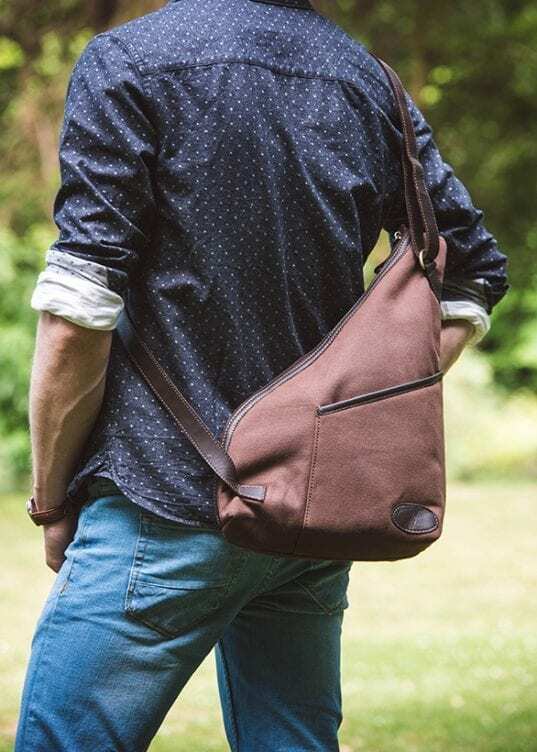 Another alternative for carrying your belongings around for the day would be our Waxed Canvas and Leather Sling Backpack. Whether you are in South Africa, Tanzania or Kenya, heading away on a safari holiday also allows for the perfect opportunity to venture out and explore the country itself. The sling backpack is ideal for day trips and is nicely secured to protect everything inside. You may also want to include things like blister plasters and painkillers, if the sun becomes too much during the day. While you will no doubt have insect repellent with you there will be a lot of bugs around and it’s always useful to have some antihistamines at hand in case you do get bitten along the way. Comfort and practicality will have to win the day ahead of style on some occasions, so stay away from white and bright colours wherever you can. It’s all about blending into the surrounding landscape like a chameleon wearing animal-friendly greens, beiges and khakis. Camouflage clothing may have you confused with local military (and in some countries this is not a mix-up you’d want to make) and try to avoid wearing black or blue, as these colours can attract tsetse flies. Long trousers and sleeves will offer some protection against thorns and insect bites too. An essential item to have ready for the end of the day is a leather washbag. The temperature will feel close to your skin throughout the day and you’ll need to freshen up to clear away the dirt and dust you’ll pick up from being out and about. Keeping all your belongings together makes it quick and easy to pop in and out of the shower to freshen up and enjoy your evening plans. For the day time you’ll also have to pick out some sensible footwear as there will be quite a bit of walking involved. Walking boots or trainers are a good option, especially as the surface will be quite uneven in places. Also remember that the dry season runs from June to October, so if you are planning to head away after this period, have protection with you to shelter from any sudden rain downpours that may appear. The most important piece of advice we can give to you is to have an amazing safari! These holidays are often a once-in-a-lifetime experience, so prepare well, take the necessary precautions and have as much fun as possible!